You can never predict with any certainty which crops will do well at the beginning of the season. This year, the Swiss chard, usually one of my bankers, all ran to seed in May and I was barely able to pick a single leaf. I planted the borlotti beans far too late and despite the fine summer and mild autumn, they never caught up. And the tomatillo seeds inexplicably refused to germinate - I got a grand total of three plants from 20 or so seeds sown. Thinking about how to ensure better germination rates, I considered saving seed from this year's tomatillos to provide seed for next season. Horticultural lore says that over generations, self-seeded plants will become more and more adapted to the specific conditions in your soil - your terroir, if you like. This is one reason why saving your own seed is so effective (it's also economic and sustainable, but let's just stick with the adaptive advantages for now). The idea of saving seed from my plants has always been irresistible but there are practicalities to take into account. You should also only save the seed of open pollinated plants. These are plants which either self-pollinate, or which are pollinated by a plant of the same variety. The resulting seeds will then 'come true', ie, produce fruits like those of the parent plants. Don't try saving seed with hybrid (F1) plant varieties - they won't come true to type. And if you grow more than one variety of a plant - or indeed, if your neighbour does - you may get undesirable cross-fertilisation: the seeds you gather and sow won't then come true to type. Squash and pumpkins are particularly known for this. Even with self-fertilising plants like chillies, it's recommended to isolate the different varieties because they will also cross-pollinate, for example by bees en passant. If tomatillo seeds can be tricky to germinate, then seeds which you have saved yourself could well be more likely to sprout the next year, the parent plants having thrived in the comparatively cool, damp UK conditions. The plants that grow from the saved seed will then be even more predisposed to do well in my allotment, having been derived from two generations of plants which managed to deal with London clay and the omnipresent bindweed. And so on, through the generations, until the plants are completely at home, strong and reliable and productive. That's the theory, anyway. I reckoned saving tomatillo seed should be similar to that of its cousin, the tomato. It turns out that it's quite a bit simpler. 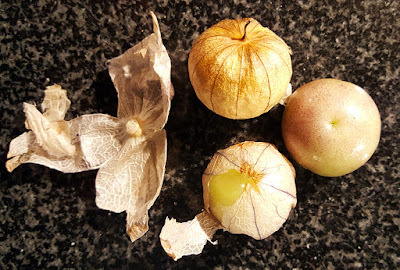 With tomato seeds, you have to let them ferment a bit, with tomatillos it's a comparatively fuss-free process. Bottom left: 3) Sieve the contents of the jug; 4) spread the seeds out on a plate to dry. First, choose the fruits you wish to select seed from. These should be fully ripe, large, prime specimens. Remove the outer husk so that you are left with what looks like a green tomato. You need to separate the seeds from the flesh and the best way to do this is to give them a quick whizz in a blender (top left, above). This seems quite counter-intuitive, but it is effective and won't grind up the seeds themselves. If you have a pulse function on the machine, use this to ensure that the fruits get only a brief blitz. Next, scrape the tomatillo pulp into a jug and cover with cold water (top right). Give the mixture a quick stir. The seeds will sink to the bottom leaving the pureed flesh at the top. You can skim this off and rinse the seeds through a sieve until all the flesh has been removed and you are left with the seeds in clear water. 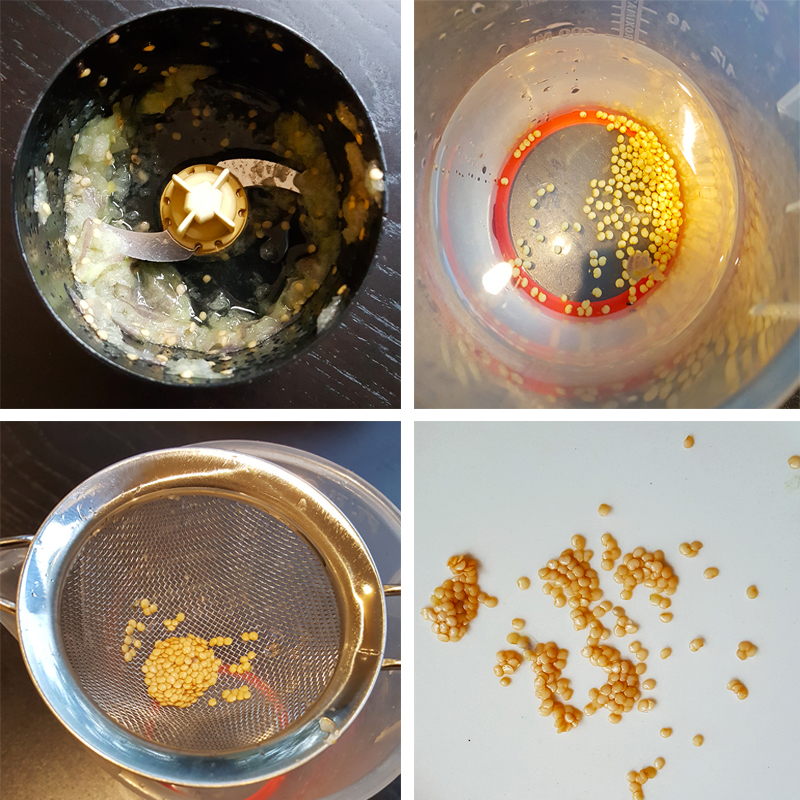 Drain the contents of the jug through a fine sieve (bottom left) so that you are now left with just the seeds. These should be left at room temperature to dry out: spread them on a plain plate or similar non-absorbent surface (bottom right). DON'T be tempted to spread them on kitchen towel or a tea towel or anything similar: the seeds will adhere to the absorbent surface and you won't be able to pick them off again. The seeds should be dry in 2-3 days. Transfer them carefully to a paper bag or envelope, label with the variety and the date, then seal and store somewhere cool and dry. 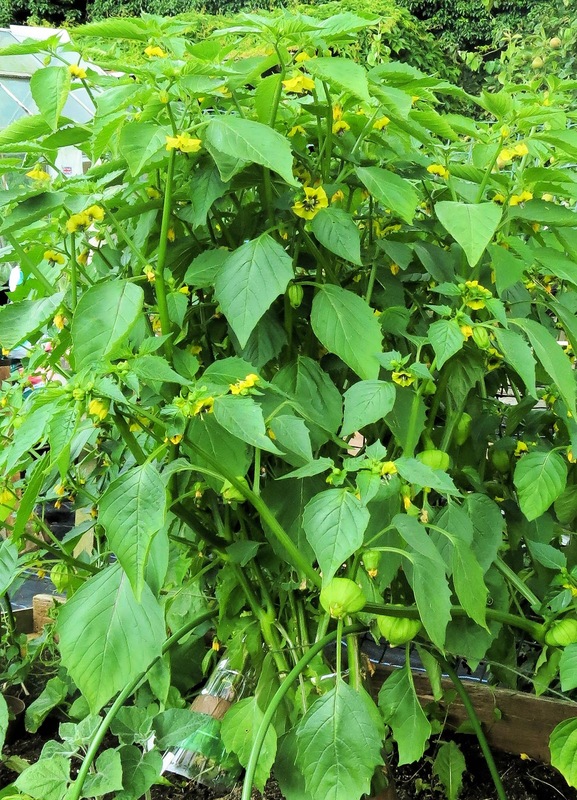 Tomatillo plants won't withstand frost, so you will need to start the seeds off indoors in spring. I usually sow mine in March, either in modules or two to a 9cm pot. They will take around 7-10 days to germinate and can be potted on before being planted out once all danger of frost is past. I have grown tomatillos in the open ground and also in large deep pots, but it is definitely better to grow them outside. They're not self-fertile and rely on pollinating insects, so you need more than one plant, and bees and the like must be able to access them - which might be as simple as leaving the greenhouse door open, although they seem to like London summers well enough. The open ground plants do grow more bushy and produce higher yields of fruit, but the difference is not so great as to make the pots markedly inferior. Tomatillo plant in high summer showing both flowers and ripening fruits.